Battery Control Tools – Microprossesors Charge and Discharge Systems. 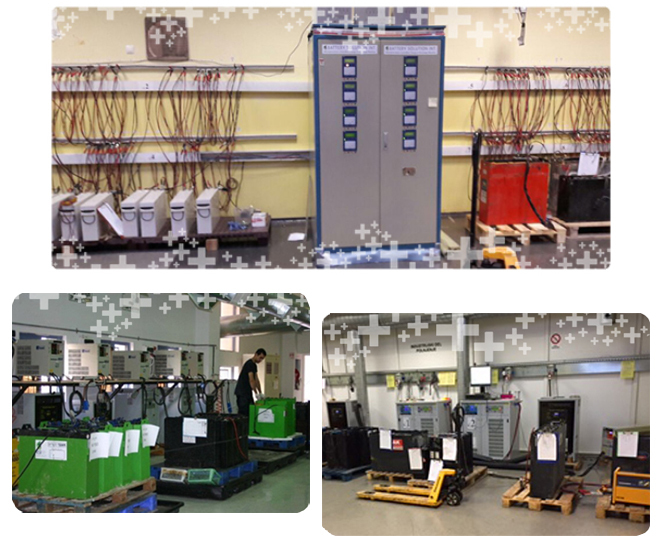 As part of the battery refurbishing process using BSI technology, we have developed state of the art computerized battery control tools. Our platinum Sophisticated system were custom tailored for battery refurbishing acttivities , with the aim of achieving battery refurbishing as fast as possible, easy operation and maximum battery output. BSI platinum system is based on digital chargers and dischargers which operate simultaneously. Inside the system lies a tiny and unique processor which matches an appropriate charge and discharge level for each battery. This process significantly reduces charge and discharge times, and accordingly shortens the battery refurbishing process. Using an intuitive touch screen, technicians can easily control and operate the system. 1. Automatic, three-stage charge converter. 2. Restores, charges, checks, strengthens lead acid batteries. 3. Cellular, web-based communications and control. 4. Services batteries with a limited charge and discharge capacity. 5. Separate charge and discharge profile matching for each battery according to its particular "battery health". 6. PC-based system supporting CSV reporting. 7. High levels of safety.